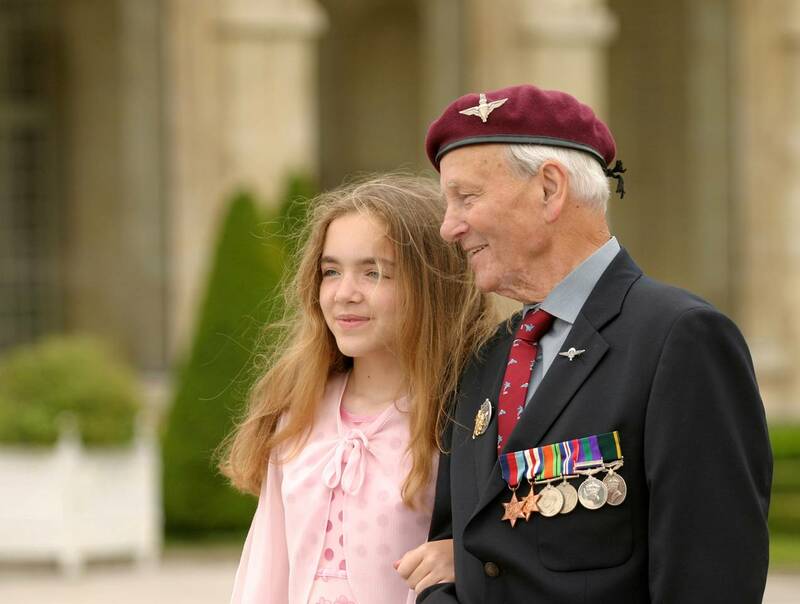 I recently discovered, that a photograph of my dad and my daughter, taken by a freelance Australian photographer during the celebrations of 60th Anniversary of D.Day, has been chosen to publicise the 70th Anniversary celebrations on posters around Caen in Northern France. This picture was spotted by an old friend of mine Jacques Perrone. 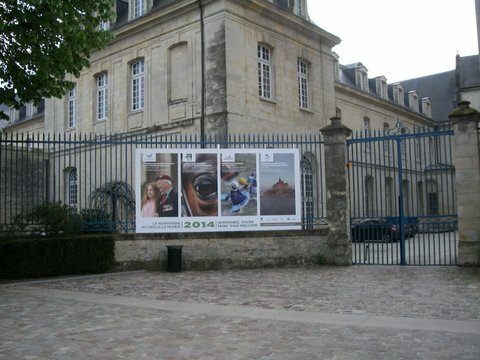 It is outside the Abbey aux Dames in Caen, France, the first city liberated by the invasion force on D.Day 1944. Dear Roger and Family – I send you two photos that I am happy to send and you be certainly also happy to receive. 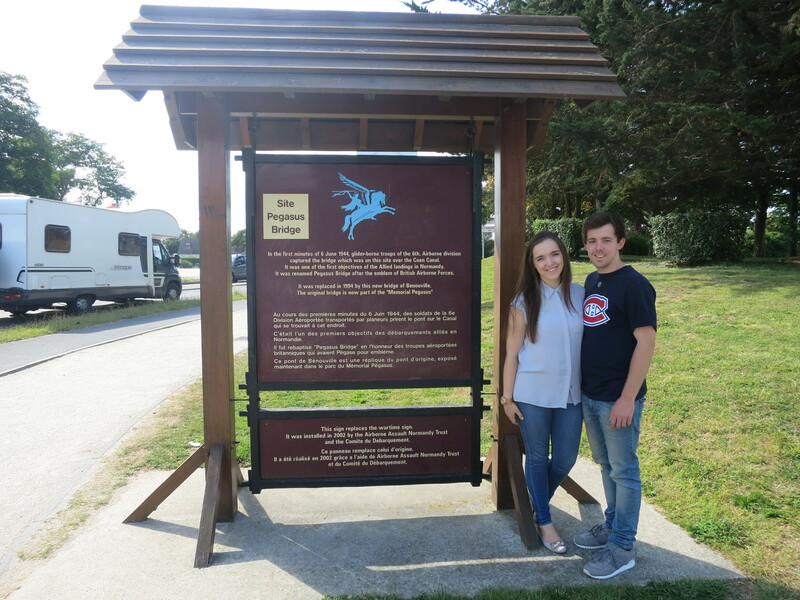 We discovered those in the area of ” the Abbaye aux Dames” – The photo of Jack and Bethany celebrate the British soldiers that came in Normandy to liberate our land 70 years ago- We are happy that Jack was selected. 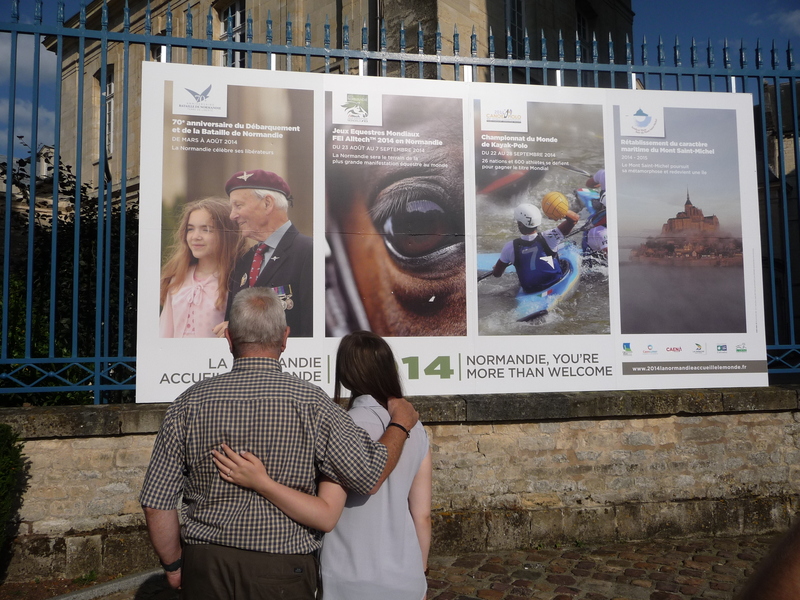 And the others photos remind the important events that will succeed in Normandy this year. 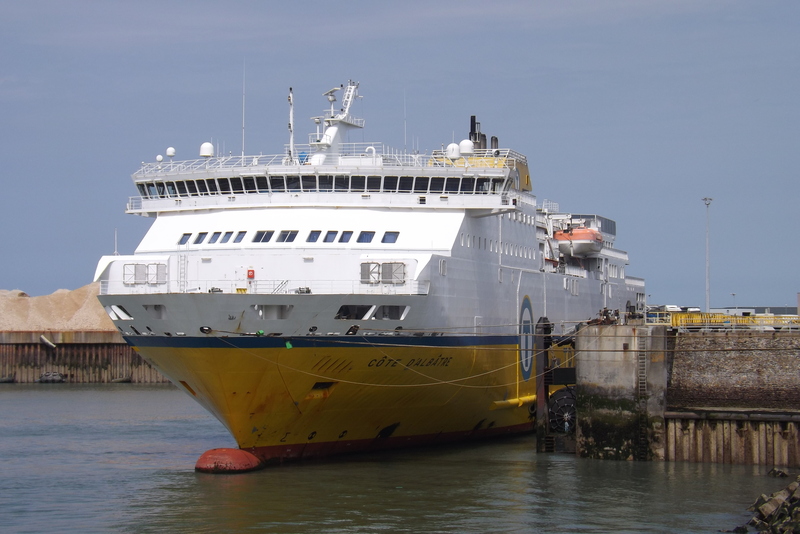 At the 6 th June there will be many celebrations on the coast and elsewhere- The Queen will come in Ouistreham with Obama and Hollande and may be Putin. I am not competent enough to answer with many words; I will learn. 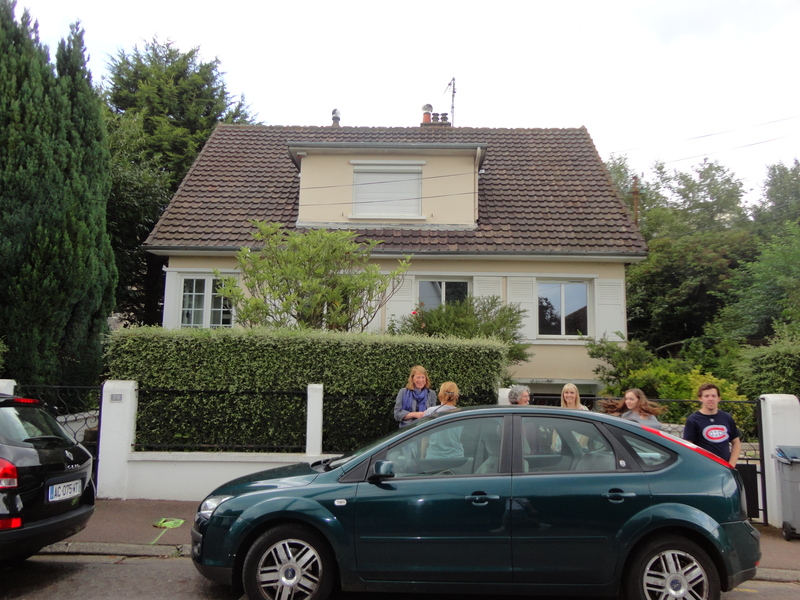 We have stayed with Jacques and his wife Rosine each time we visit France for almost twenty years. Also, in 2004 when we attended the 60th Anniversary celebrations, Jacques and Rosine hosted my parents. They ‘adopted’ him as their very own veteran. I was completely amazed at how much the ordinary people in France are grateful for what happened in 1944. They have never forgotten what the allied forces achieved during that remarkable time. They are as grateful today as they were then. This picture was taken exactly the same time as the Australian photographer took his, but from a slightly different angle. I am very proud and humbled. 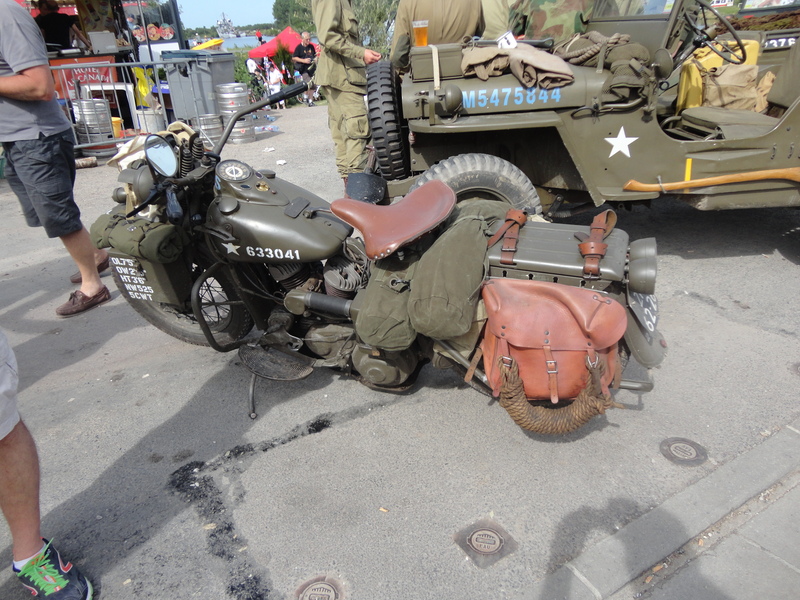 I tracked down the photographer and he has agreed to meet us in Caen in June. 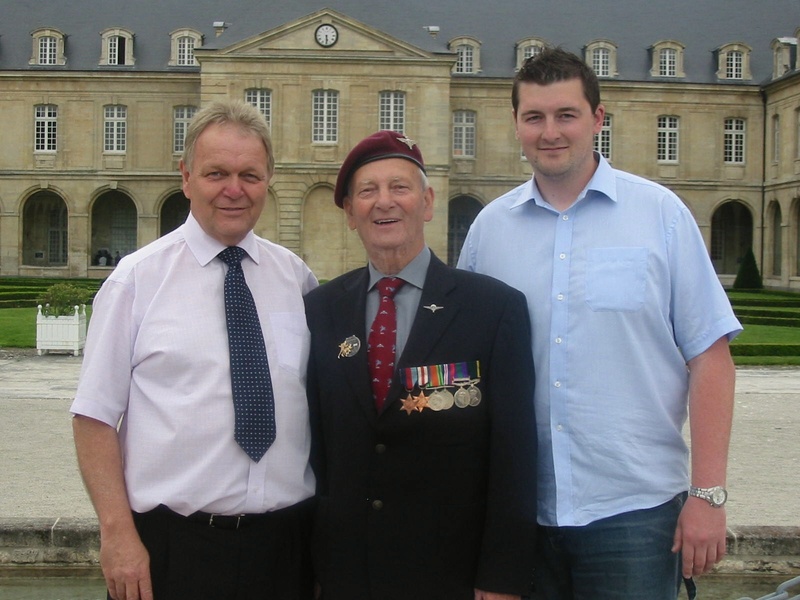 God willing, I will be in Caen with my brother and my son, along with The Queen, William and Kate, President Obama, David Cameron and Mr Putin to remember those who liberated Europe. We will be representing my dad. I hope the Queen, William and Kate like the poster. 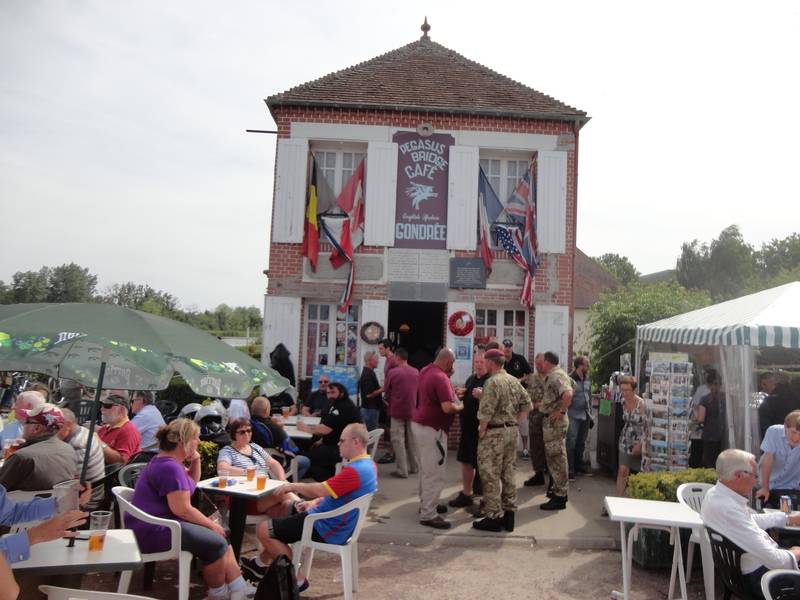 June 2014 – what happened…..
Before he passed away in 2009, I had promised my father that I would keep returning to Pegasus Bridge every year I could. 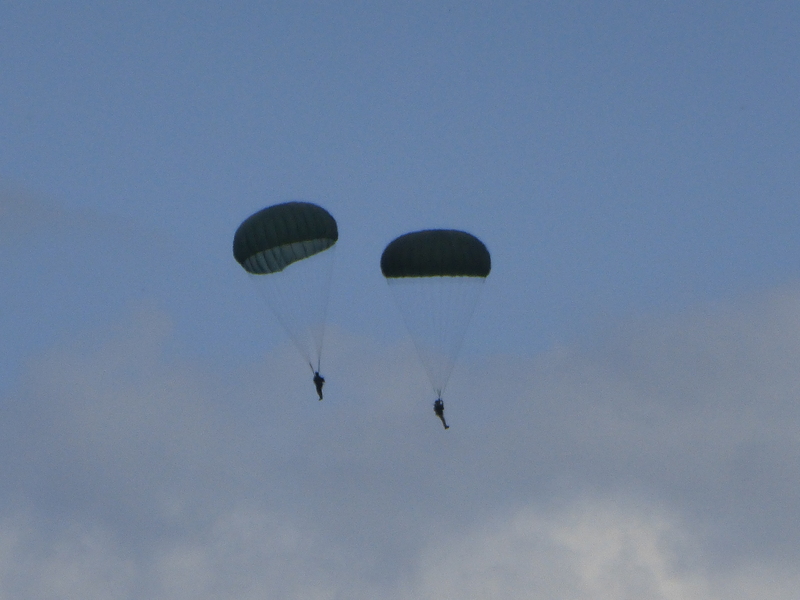 This year was to be a special one, as it was 70th Anniversary of the D-day landings. 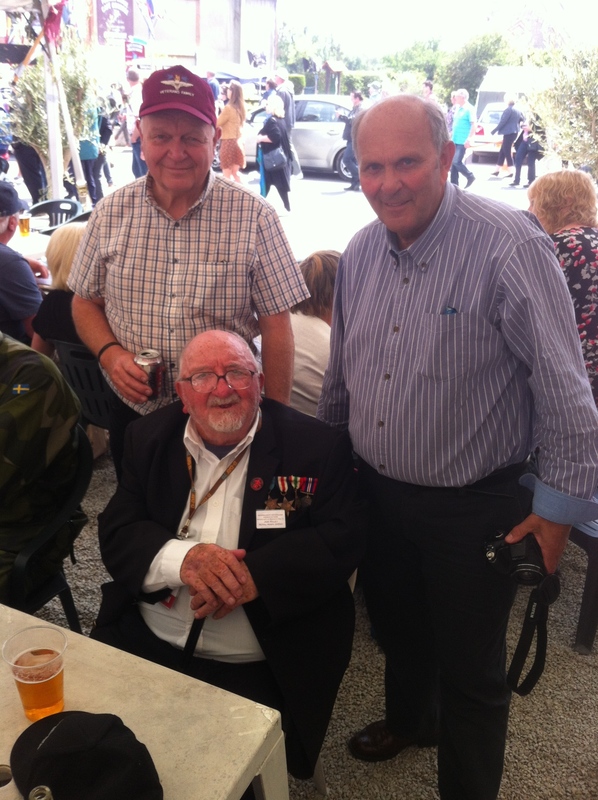 Each year fewer and fewer veterans actually attend the ceremonies in Normandy. The remembrance of 2014 was expected to be the last ‘major’ event of this kind. 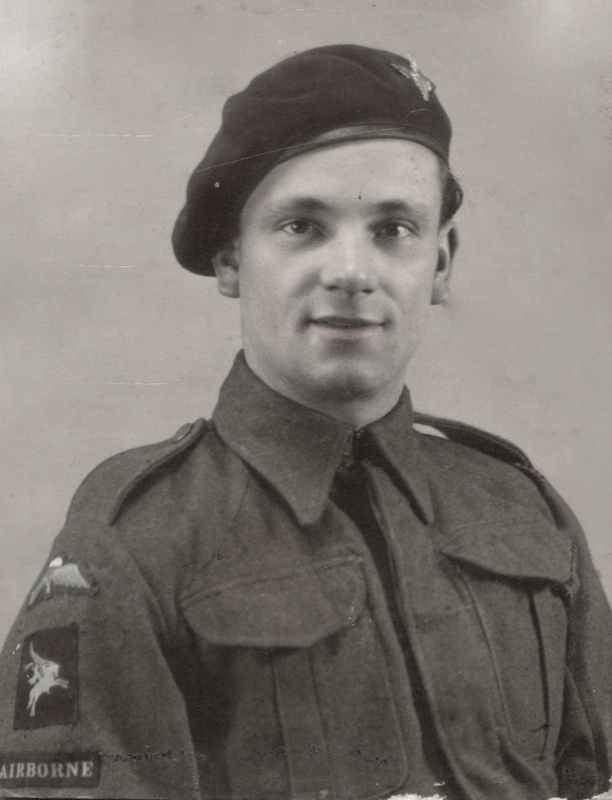 A soldier who was 18 in 1944 would be 88 today. Most of the survivors have now passed away. 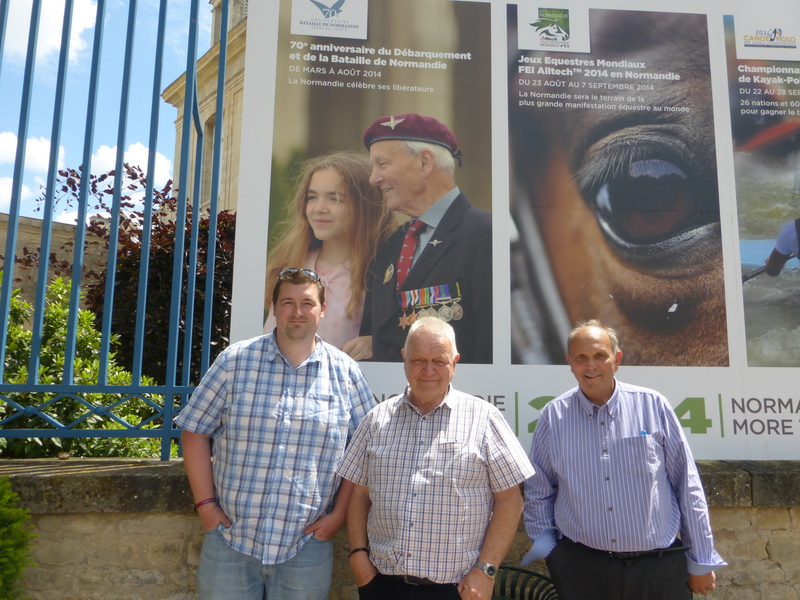 We had agreed that my brother John, son Gareth and I would travel to Caen and Benouville this year to represent the family. The news about the poster brought added excitement. 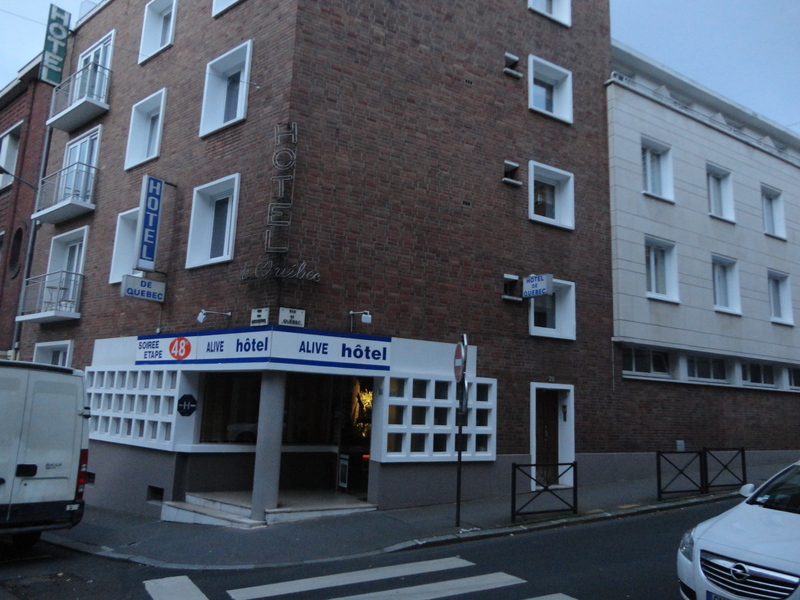 We had booked late and the only affordable hotel we could find was in Rouen, which was some 130 km away from Caen. That would be an hour and a half drive if traffic was good! 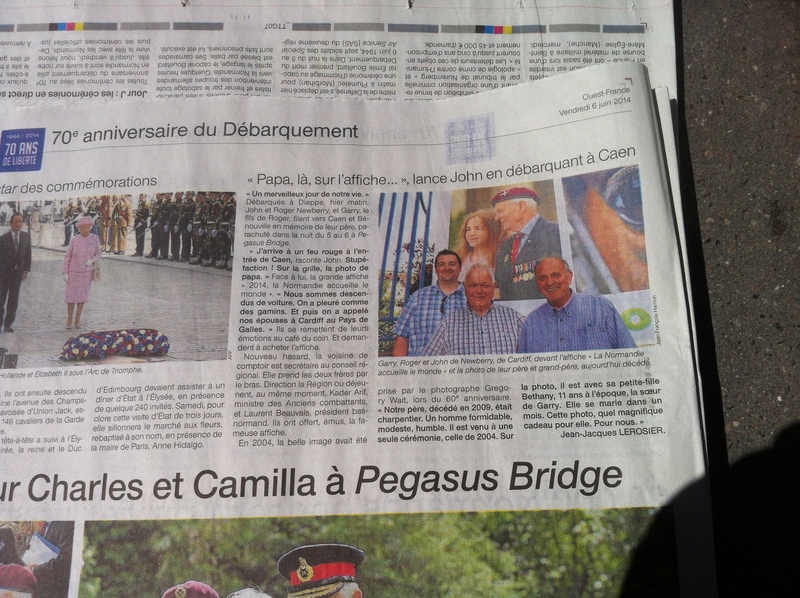 There was also the problem of access to Pegasus Bridge. The attendance of many heads of state meant security was very tight at the main venues. 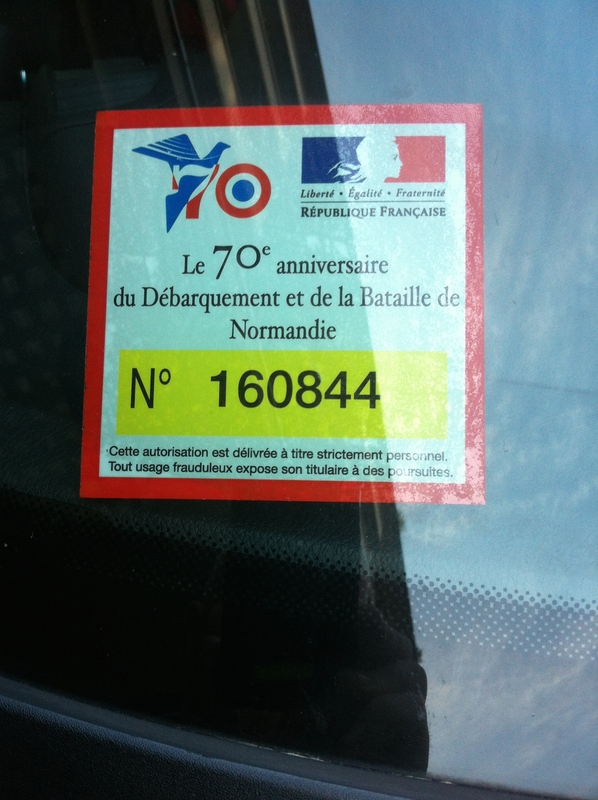 We needed to get a special visitor pass, but repeated requests to the authorities in Normandy drew a blank. 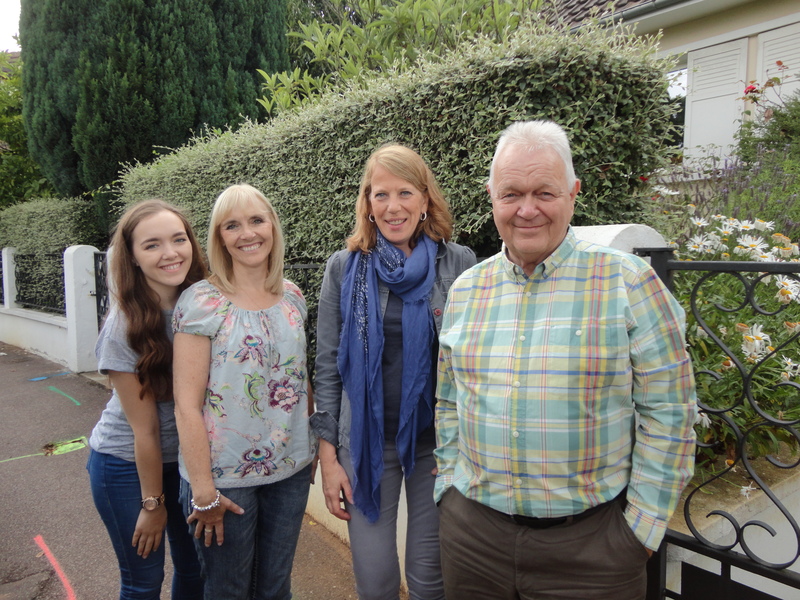 Fortunately for us, our friends Jacques and Rosine Perrone were on the case and the pass was secured as we were about to leave the UK and Rosine had arranged for it to be sent by special delivery to our hotel in Rouen. 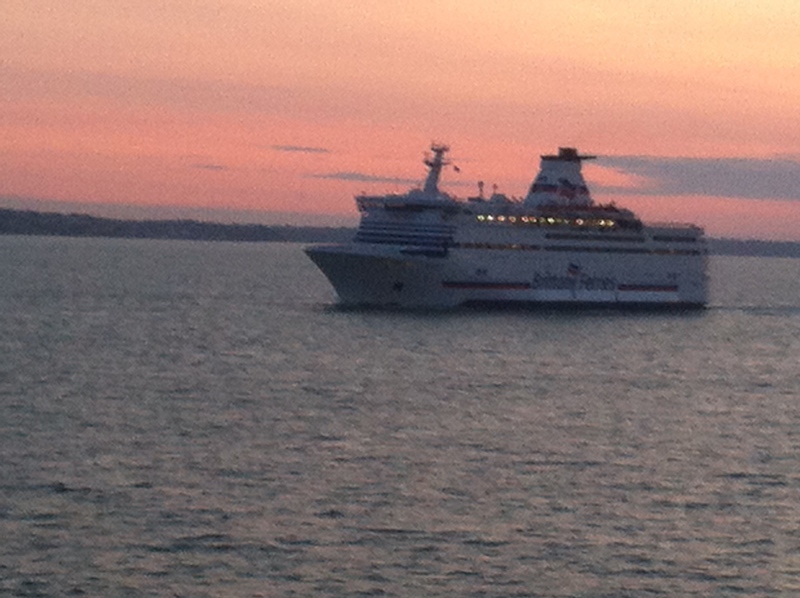 We left the UK to travel to Rouen via Newhaven and Dieppe. It was an unpleasant, middle of the night crossing usually favoured by truck drivers, eager for a crossing which fitted in with their driving and rest times. We arrived in Rouen as dawn was breaking and strolled the streets in an eerie silence. Rouen, the historic capital of Upper Normandy, was the scene of the martyrdom of Joan of Arc, convicted and then burnt at the stake in 1431 on the Place du Vieux Marché. 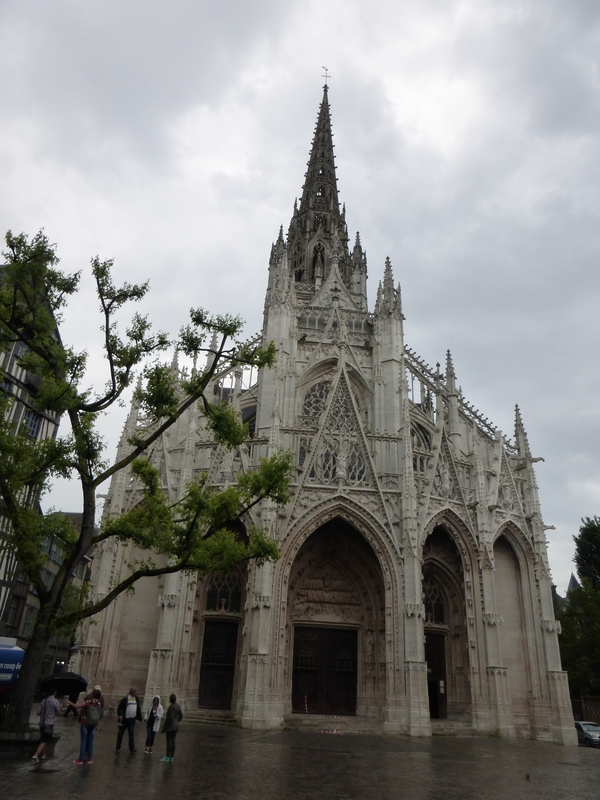 Rouen is also the “Town with a Thousand Spires”, and over the centuries different parts of the town blossomed with jewels of religious architecture. Notre-Dame Cathedral inspired Monet to paint his Cathedral series. The laid out banks of the Seine are a wonderful area to take a stroll, Rouen is a young town, with a well-developed nightlife, but all we saw were deserted streets. 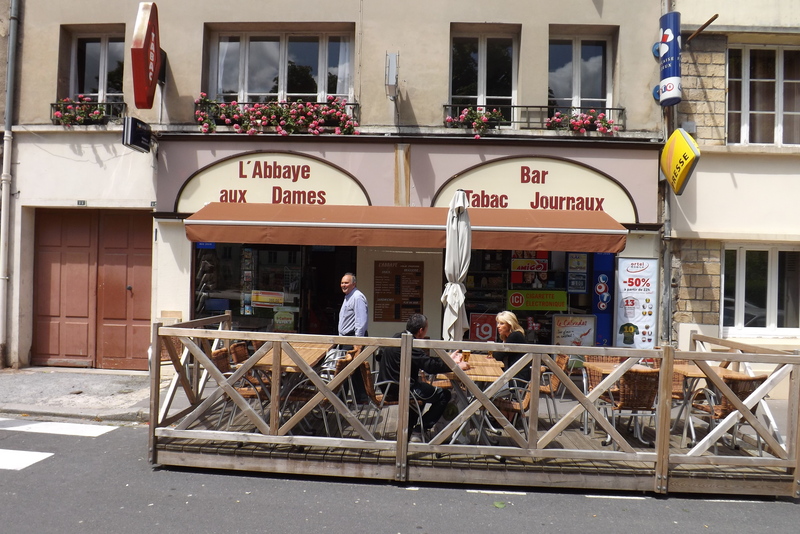 We found a tabac that was open and enjoyed a cup of coffee with some chefs finishing off their beers after a long night’s work. They would soon be heading home for bed! Adventure awaited us! 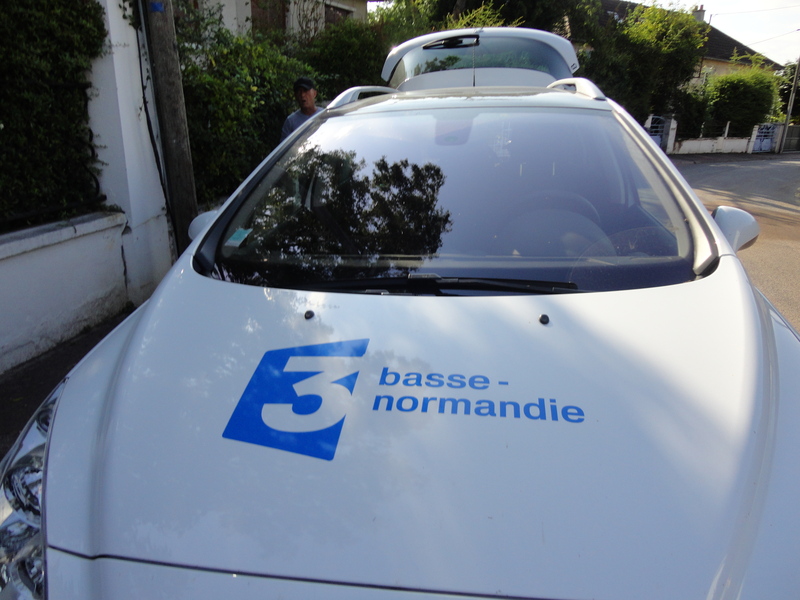 We had to wait for our small hotel to open so we could collect our car sticker, before heading off to Caen. 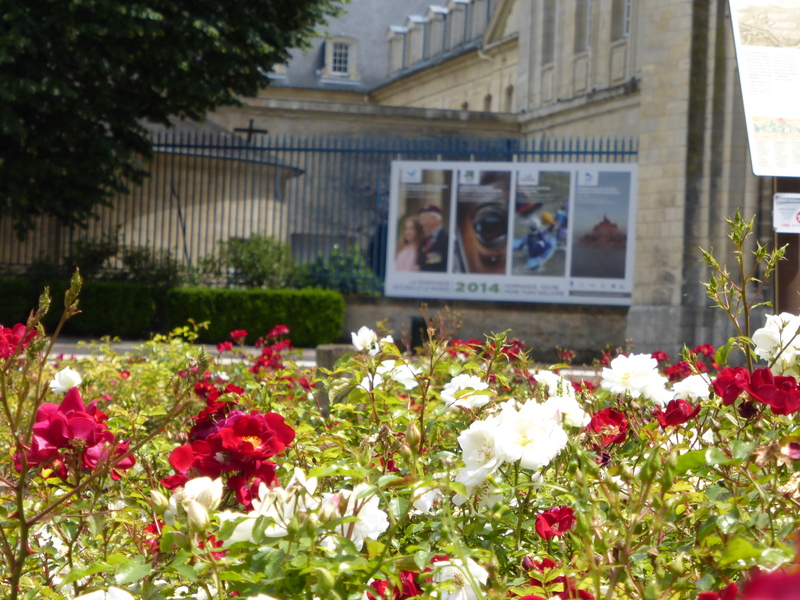 After several hours we arrived in Caen headed for the Abbaye aux Dames, which is situated near the centre of Caen. The Abbey of Sainte-Trinité, also known as Abbaye aux Dames, is a former monastery of women and is now home to Regional Council of Lower Normandy. 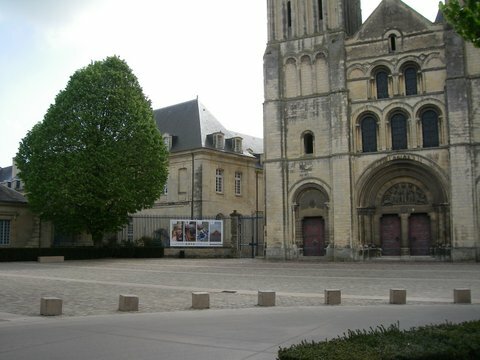 The complex includes the Abbey Church of Sainte-Trinité. The abbey was founded as a Benedictine monastery of nuns in the late 11th century by William the Conqueror and his wife, Matilda of Flanders as the Abbaye aux Dames (“Women’s Abbey”), as well as the Abbaye aux Hommes (“Men’s Abbey”), formally the Abbey of Sainte Étienne. The works began in 1062, starting from the rear and finished in 1130. Matilda, who died in 1083, was buried under a slab of black marble in the Abbaye. The original spires were destroyed in The Hundred Years’ War and replaced by less striking balustrades in the early 18th century. The community of nuns was dispersed and suppressed by the French Revolution. In 1823 the local city council decided to transfer the ancient Hotel Dieu (possibly also founded by William the Conqueror, but more likely Henry II), to the former cloister for use as a hospital, and the ‘canonesses regular’ who had assumed responsibility for the hospital from the two abbeys during the 14th century, established themselves there. The canonesses continued to operate there until 1908 when the facility was given to the Hospice Saint-Louis use as a nursing home. 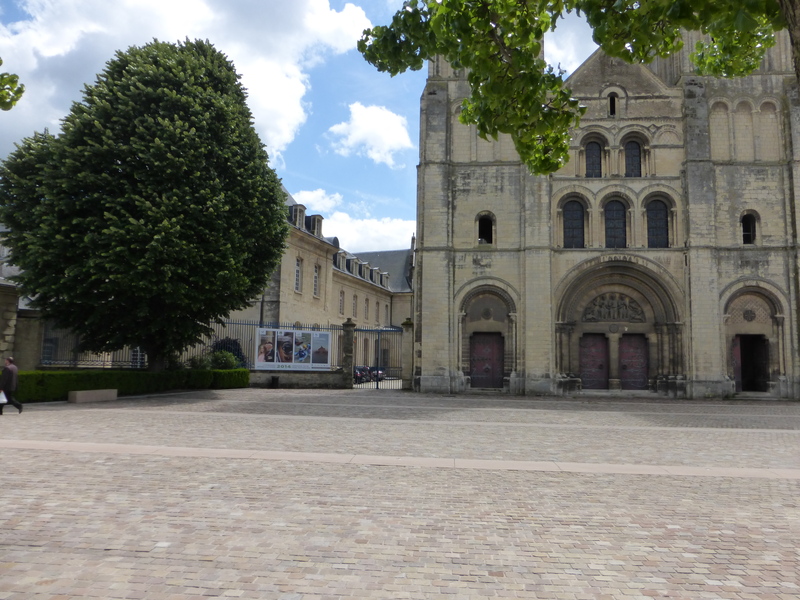 We parked and entered the square in front of the Abbaye. It was impossible to miss the poster. Standing in front of it for the first time was an incredibly moving moment. 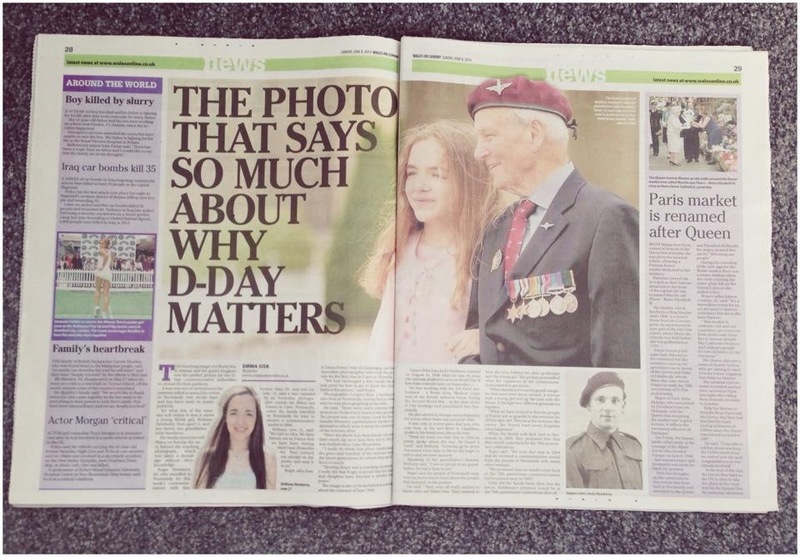 To see our father’s image being used to promote the 70th Anniversary of D-day was most humbling. All three of us – grown men – wept openly. We tried to imagine our father’s reaction, had he been able to be with us. We guessed, a mixture of pride and embarrassment. He was a quiet, unassuming, gentle man, who hated being in the spotlight. We could see our mother standing there, with her hands over her mouth, bursting with pride at this image of the man she adored, since the day she first saw him way back in the dark days of the war. We realised then, that we had made a monumental mistake in not bringing my daughter Bethany with us. Her beautiful smile beamed out from that poster, radiating hope for future generations. I knew straightaway that I had to return with her to show her and share this with her. We spent some time taking photos, laughed some more and cried some more, before my brother told us he was off for a cup of coffee as he was finding the mixture of emotions ‘tough to deal with’. What happened next was just amazing. A series of incredible coincidences paved the way for a wonderful story to unfold. John made his way to a nearby tabac, and as he waited to be served he thumbed through a brochure advertising things taking place in Normandy and he came across the picture of my father and Bethany, so he pointed out to the lady next him that he was the son of the gentleman in the picture. What he did not know was that this lady worked for the Regional Council and was a part of the team that chose the picture in the first place. This was so exciting for them. Suddenly this picture had a story behind it. The old veteran and the little girl suddenly had names and a family and a story to tell. 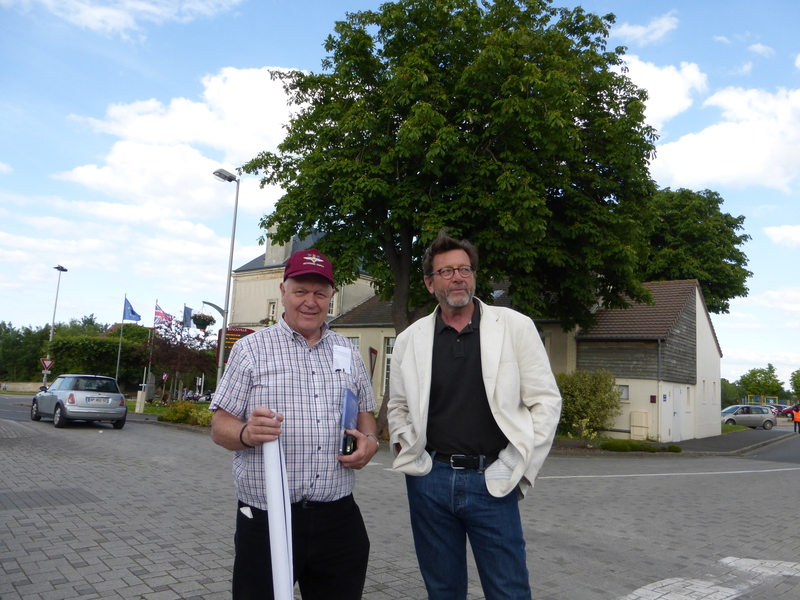 By now, we had joined John, and we were excitedly invited to the offices of The Regional Council in the Abbaye. 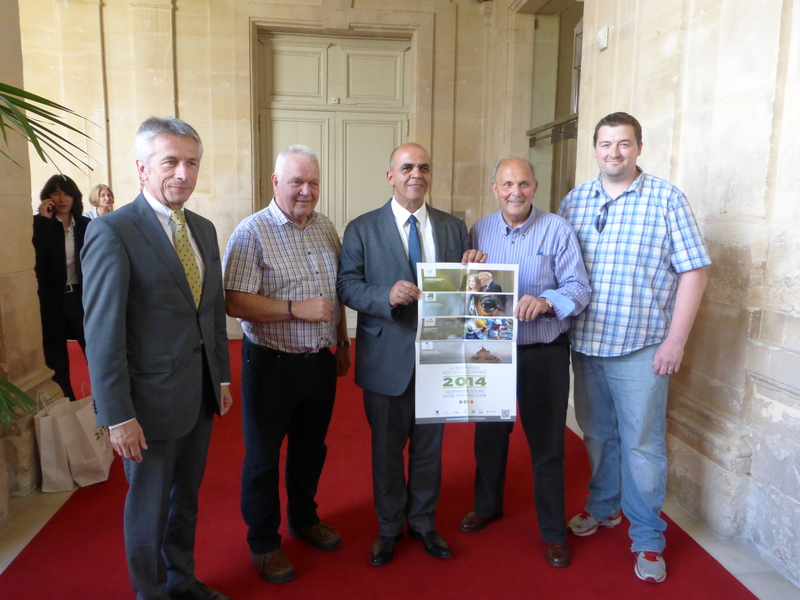 Here we met other regional officials and the French Government minister for Veterans’ Affairs. The French press were also in the building and we were interviewed and my brother also recorded an interview for the local radio station. All were eager to learn about the two characters in the picture – the old veteran and the little girl. What we were able to tell them, they found amazing. 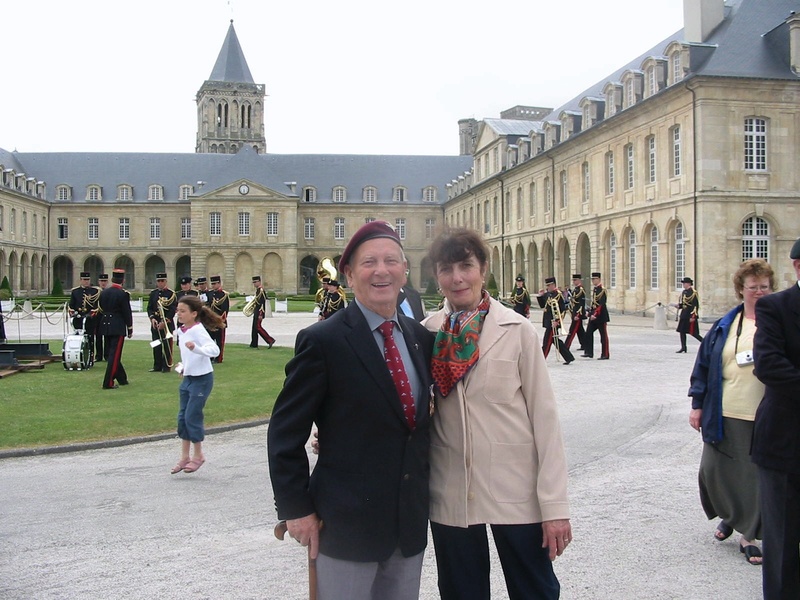 The picture had been taken in 2004, when we came to celebrate the 60th Anniversary od D-day. 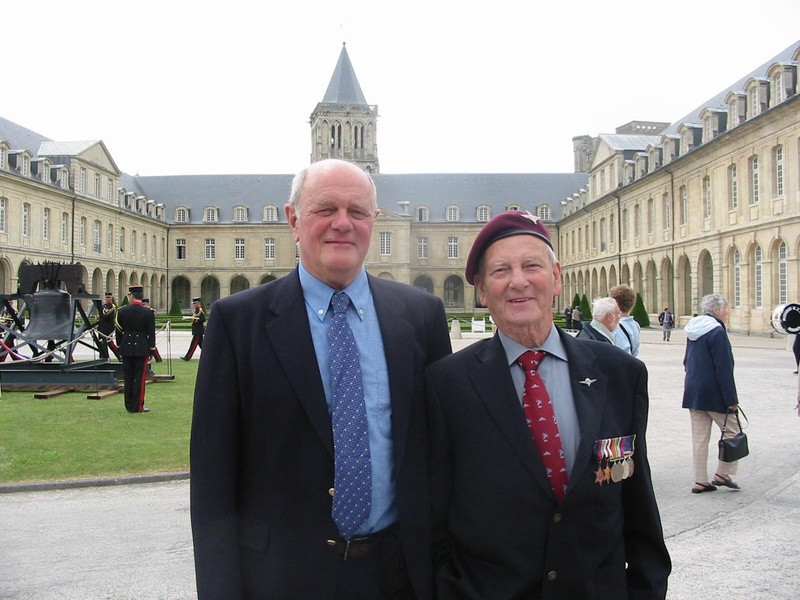 At that time my father had been awarded a special commemorative medal by the people of Normandy. The photograph had been taken by an Australian photographer. Where the picture had been for ten years, I do not know, but it had been chosen, one out of many, to help publicise the events surrounding the 70th anniversary. 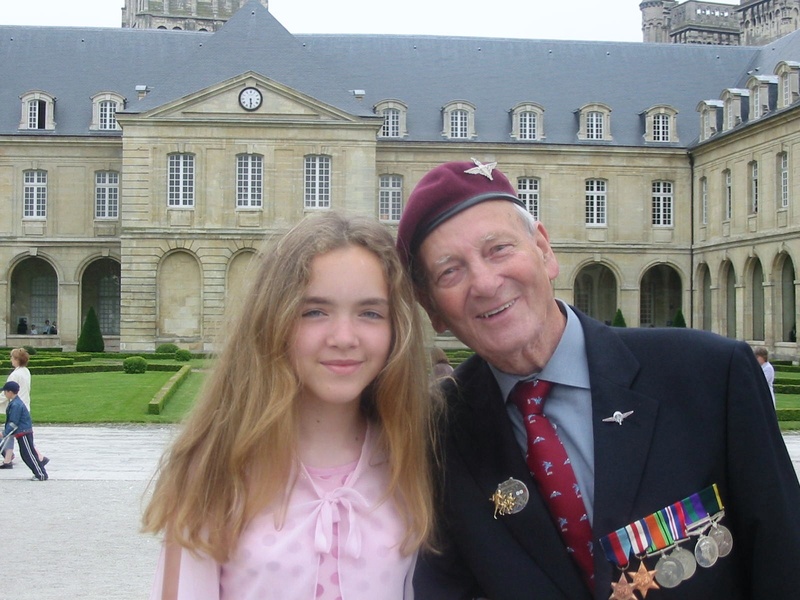 To them, the picture was a special one, but what they did not know was that the veteran was Sapper John Newberry, who was dropped by parachute near Pegasus Bridge on D-day 1944. 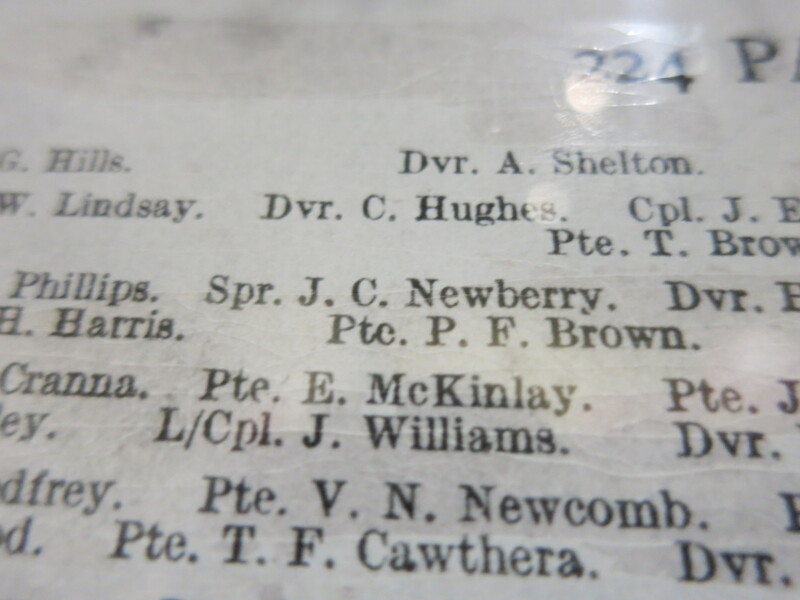 He served with the 6th Airborne Division and was part of 224 Field Ambulance. The little girl was his grand daughter, Bethany Newberry, then aged ten. She too has strong links with Caen. Bethany counts this great city almost as a second home. She first came to Caen in 1993, when she was just one year old. That year, we were invited by a friend, Margaret Davis, who lives in nearby Louvigny, to assist in her English lessons, by taking part in a Christmas presentation. 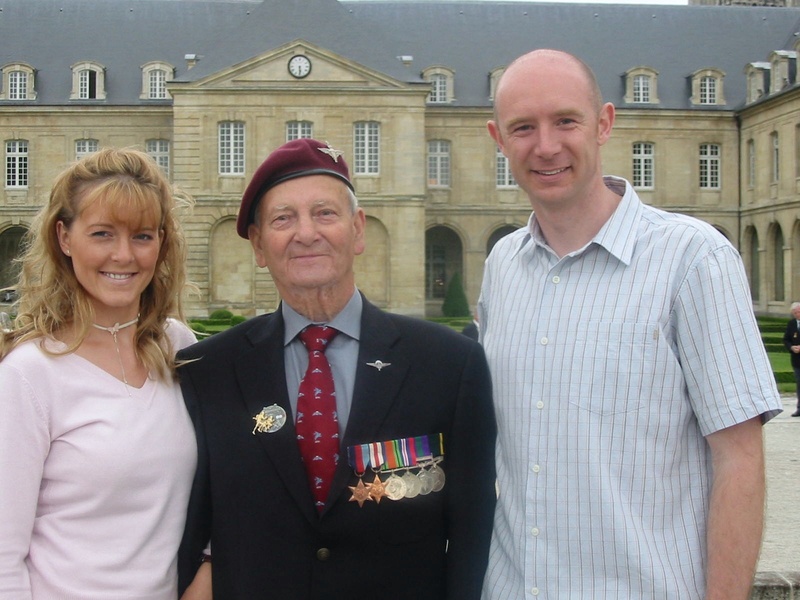 Bethany has been coming every year since and has made many other visits to Caen as well. 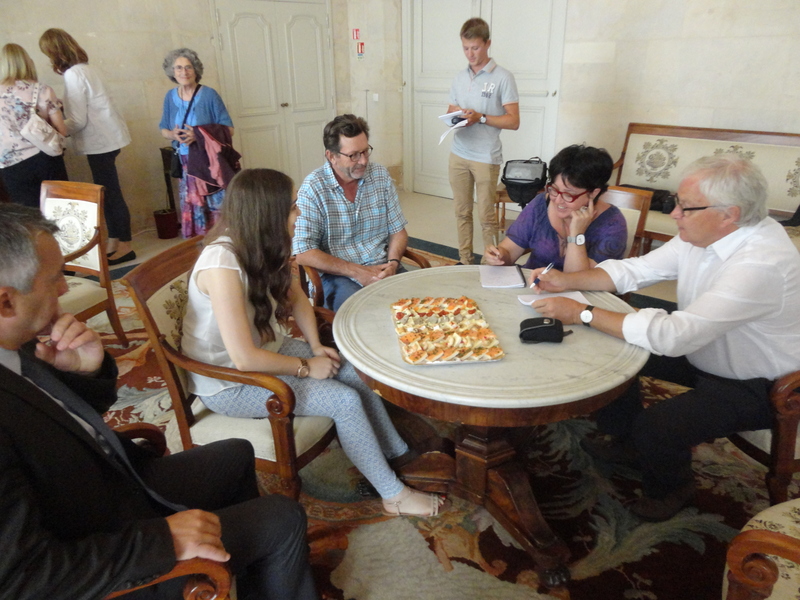 Also present at that time was Emmanuelle Tirilly, the press attaché to the Regional Council. She was brilliant in organising things and sending us the resulting newspaper articles. We left the offices buzzing with excitement at the way things had worked out. We enjoyed the day at Pegasus, savouring the atmosphere, meeting up with an old friend Joe Riley now 92 years of age. We had one more meeting to look forward to; I had arranged to meet with the photographer Greg Waite at Pegasus Bridge later that day. 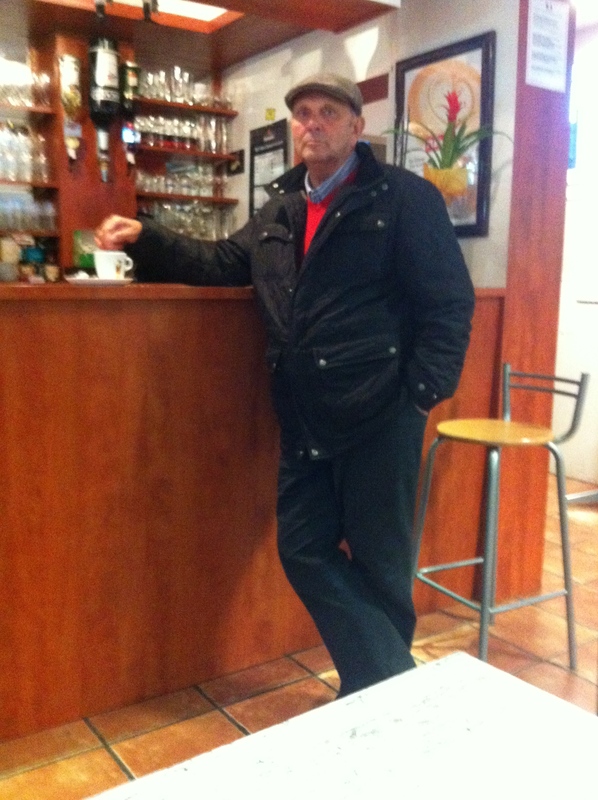 My friend Jacques Peronne had tracked him down via the Internet and passed his e-mail address on to me. We met Greg, as arranged in Benouville. He was truly wonderful and gave us copies of the poster to take home and we chatted about the impact the picture was making. He allowed us to use the picture as we wished. I guessed I would probably never meet him again. 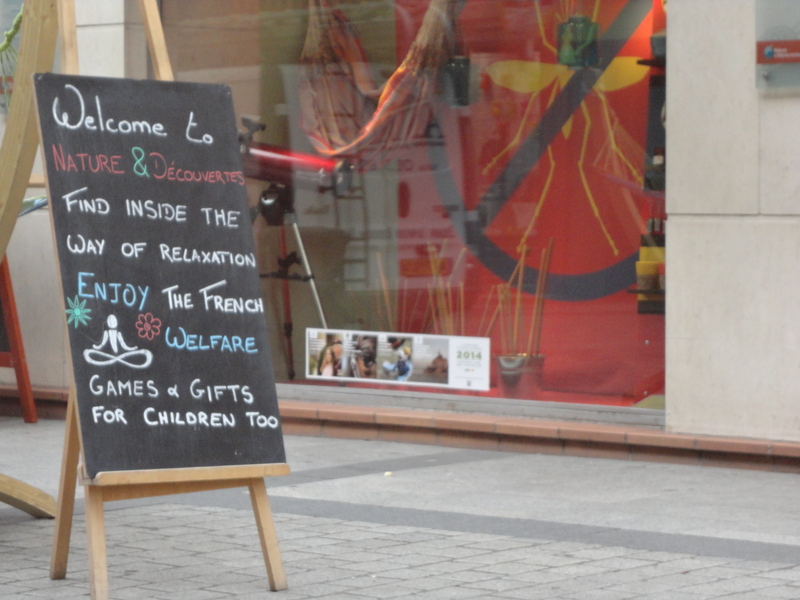 We enjoyed the rest of our visit – although we found the long trek back and fore to Rouen a bit difficult! 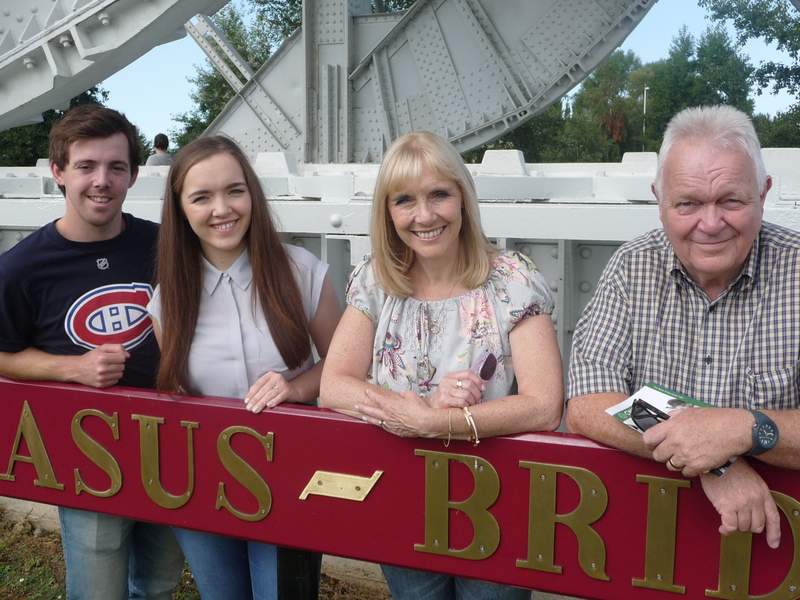 To be at Pegasus Bridge is, for us, an almost spiritual experience. We feel our father’s presence here in some strange way. It’s where this gentle, loving man fought for freedom, it’s where his friends fell and it’s where his friends are buried. We make a point of visiting the British Cemetery at Ranville every single time we come. While all this was going on Bethany tweeted about the picture, in response to a request put out on the BBC. Huw Edwards re-tweeted it and before long The Wales on Sunday newspaper was on the phone to Bethany for an interview. The reporter spoke to her and me and the following Sunday a beautiful article appeared in the Wales National Sunday paper. When we arrived home we shared our experiences and made plans to return with the poster girl. 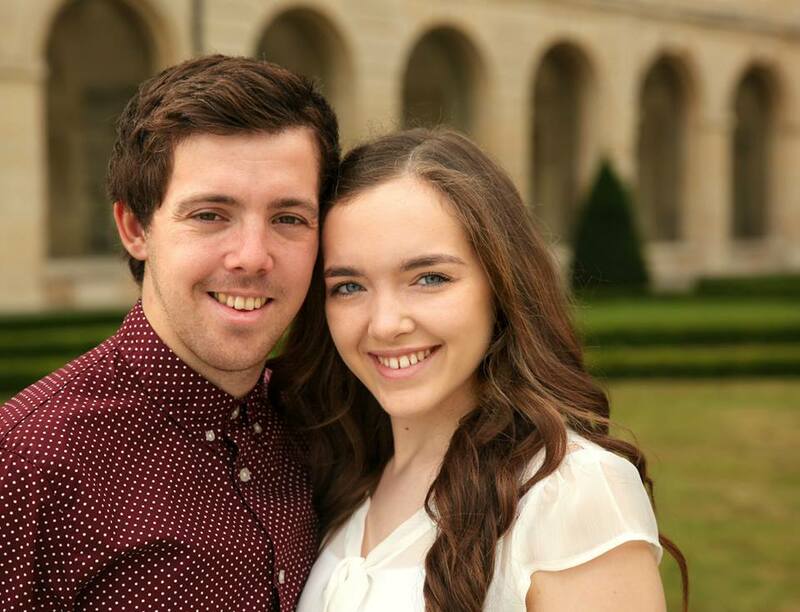 Bethany is now 10 years older and at 21 is preparing to marry the love of her young life, a brilliant young man called Alex. The only free date for our visit was in early August, a date that coincided with the 100th anniversary of the start of The Great War. The cost of crossing the channel in mid summer coupled with the fact that Bethany had just started a new job, meant that the journey had to be a short one, so there was much to pack in to such a short time. 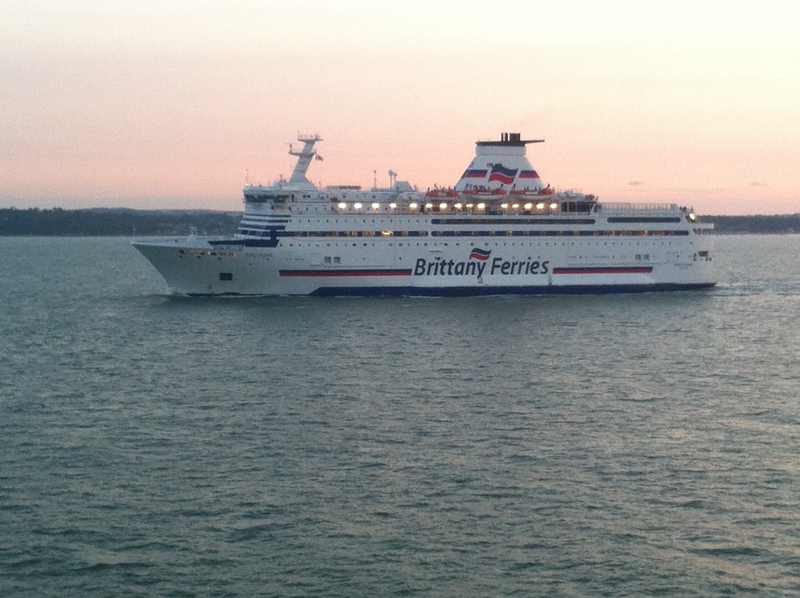 We booked a 24-hour ticket with Brittany Ferries to Ouistreham. Bethany, Alex, Jean and I set off, full of excitement and anticipation. I had kept in touch with Emmanuelle Tirilly and was overwhelmed with the kindness she was showing us. She insisted that we stay in her home and promised she would help us fit as much as we could into our short visit. We had arranged to meet her in the Pegasus Memorial Museum, straight after getting off the ferry from the UK, mid afternoon on Sunday 3rd August. We were a little late and a little nervous; I could not really remember what Emmanuelle looked like. Our worry was unnecessary. We all knew each other straight away. 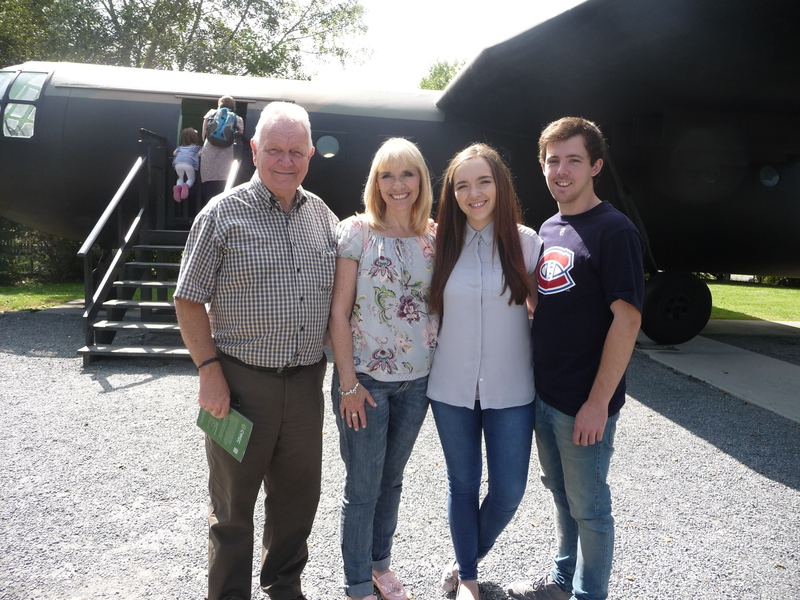 We toured the museum and showed her my dad’s picture with 224 Field Ambulance. 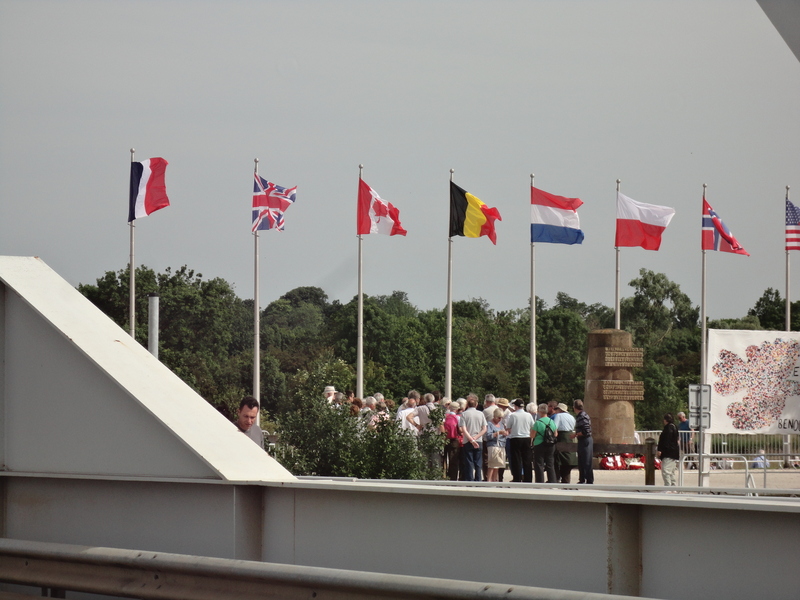 Afterwards we explored the area around Pegasus Bridge. It was Alex’s first visit and it was good for us to see it all through new eyes. 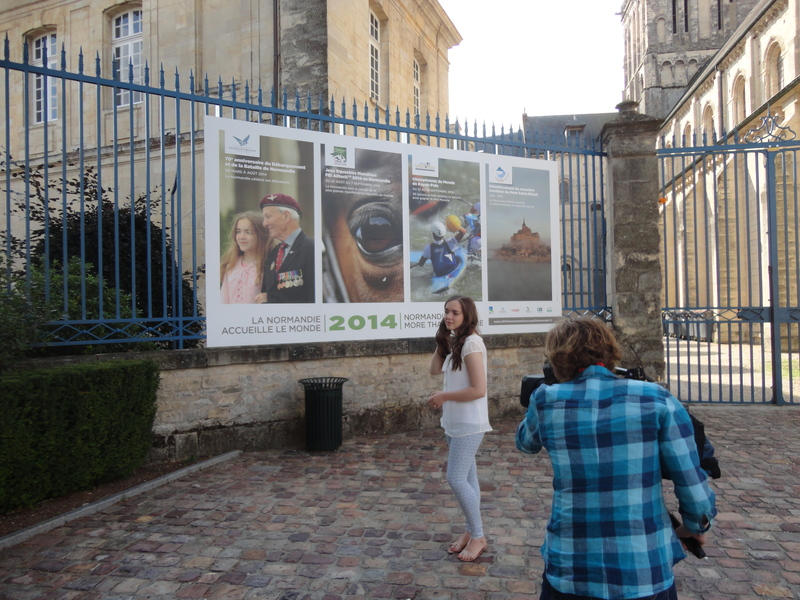 We then made our way to the Abbaye aux Dames for Bethany to see the poster for herself. Jean and Alex shared her excitement and anticipation. 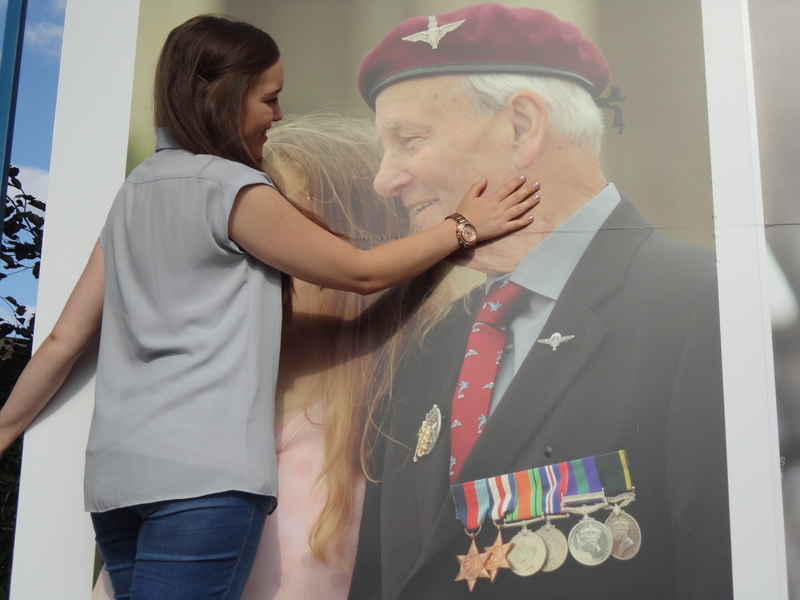 When we stood in front of the poster it was an extremely moving moment – one which we will never forget. More tears, more smiles, more reminisces. It was a beautiful moment; one we were so fortunate to share together. Emmanuelle had been very busy preparing for the visit and had arranged a full programme of tours, press and radio interviews. One reporter had even cut short his family holiday to be with us. Emmanuelle had also tried to arrange a TV interview but this could not be confirmed. We reluctantly left the Abbaye after a long while and made our way to Emmanuelle’s home. The girls settled in while Alex and I drove to Louvigny to pick up Margaret. 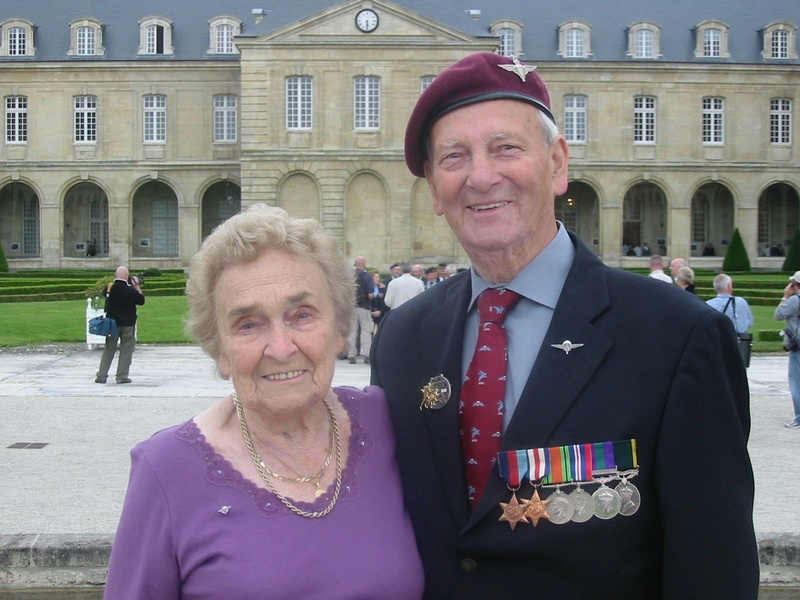 I was keen for her to be as involved as possible, as she was the main reason we have become so attached to Caen. We had great fun on the return journey with Margaret arguing vociferously with my satellite navigation system about the best route to take!! We arrived safely back at the home of our new friend. This kind French lady treated us like royalty; nothing was too much trouble. We enjoyed aperitifs and canapés in her beautiful, quiet garden before enjoying a wonderful meal in her home. It was a unique experience…. Arrangements for the following day had to be adjusted when the TV crew rang to confirm they were actually coming and wanted to arrange an interview. This was so exciting! 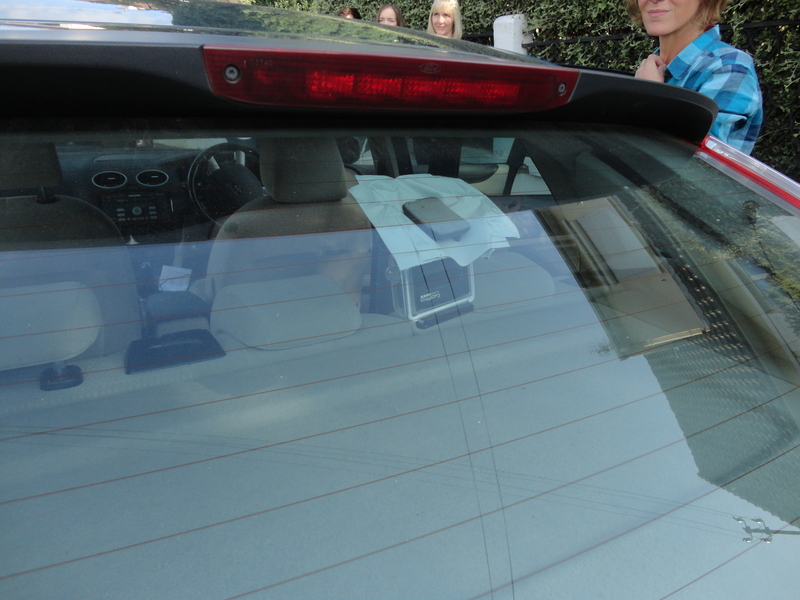 The crew arrived early the following day and proceeded to connect cameras to the inside of our car. 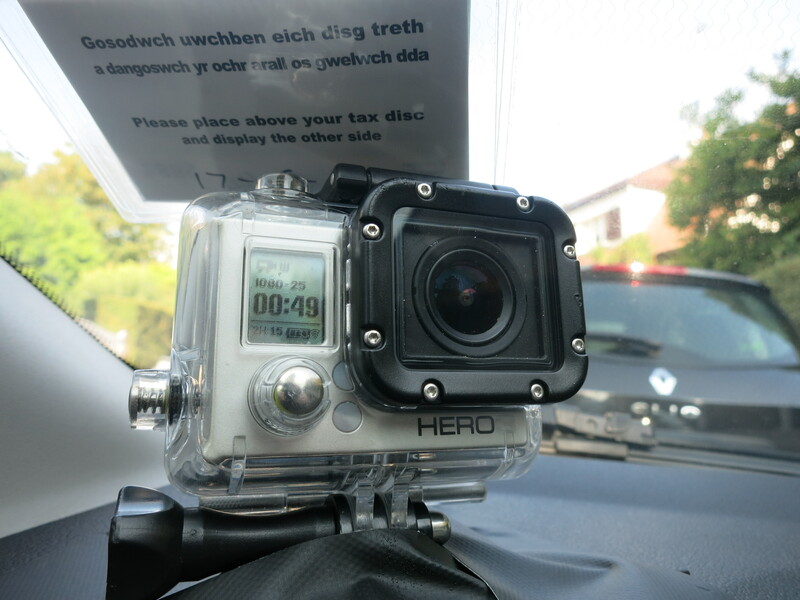 We then had to drive around Caen when instructed and there were cameras waiting on street corners to catch us as we drove by. Margaret had again agreed to join us and we met her by the Abbaye. 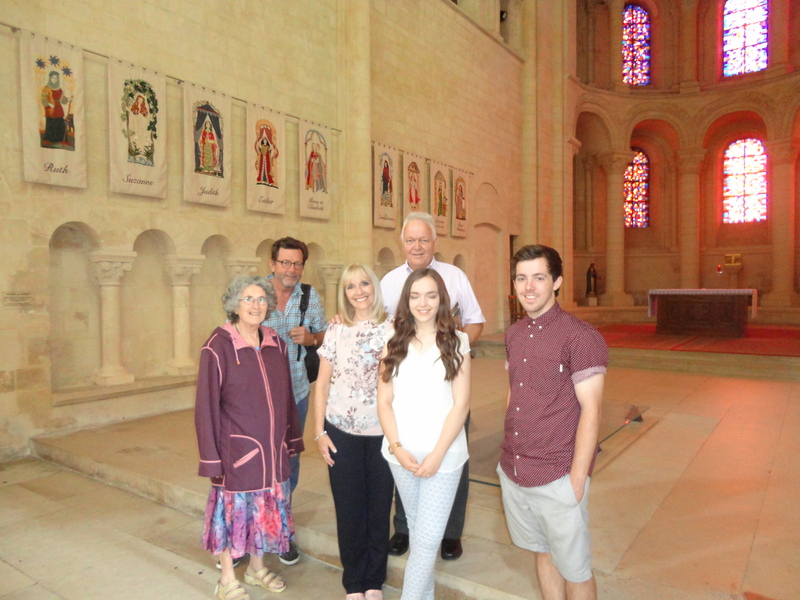 At the Abbaye our reactions were filmed and we were so proud of Bethany as she was interviewed for the Normandy TV Station – Basse Normandie. This was all very exciting, but more was to come. We walked inside the grounds of the Abbaye, where we met a smiling Greg Waite. He seemed genuinely delighted to meet Bethany at last. For ten years he had known her as the little girl in a picture. Now he saw her face to face 10 years older! He came bearing gifts! Posters, books, and even some Normandy bunting – all were bearing this precious image of the old veteran with his grand daughter. He took Alex and Bethany off to take a photograph in the exact place he had taken the original photograph in 2004. At that time, Bethany was on the arm of her precious grandfather. Now she is on the arm of another – a young man who will soon be her husband. 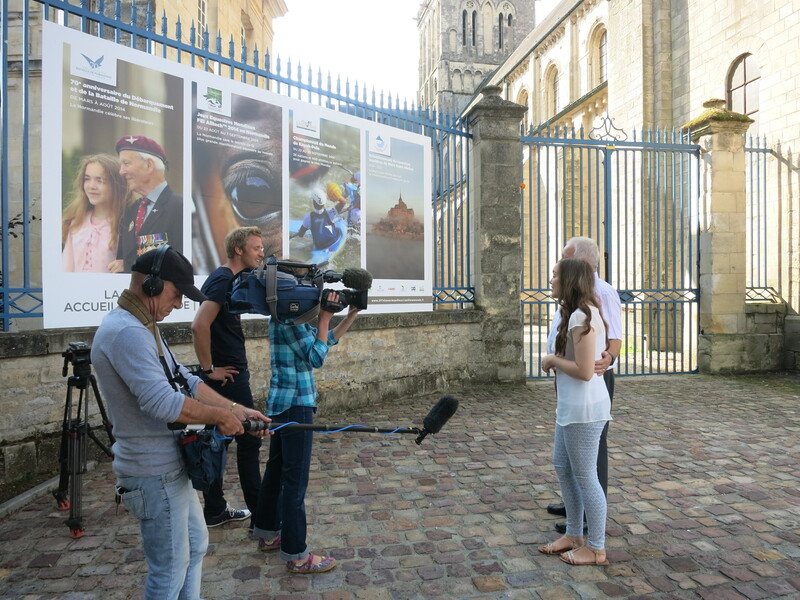 More TV interviews took place here inside the Abbaye grounds, with Greg explaining that the image had been chosen because of the beautiful way the photograph had captured the gentle dignity of the veterans, as seen in my father’s face, coupled with the hope for future generations as seen through Bethany’s smile. 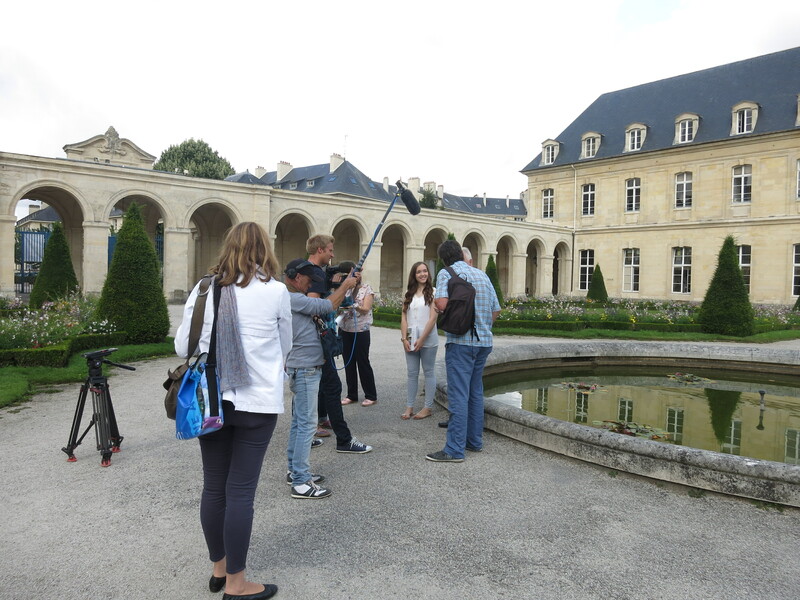 While the camera crew packed up, we said our thanks and goodbyes and were taken on a tour of the Abbaye. We visited Matilda’s tomb, now more than ten centuries old. It is a stunning building, one I have never visited despite countless visits to Caen. After the tour, we were taken to an exquisite room where there were drinks and canapés prepared for us. 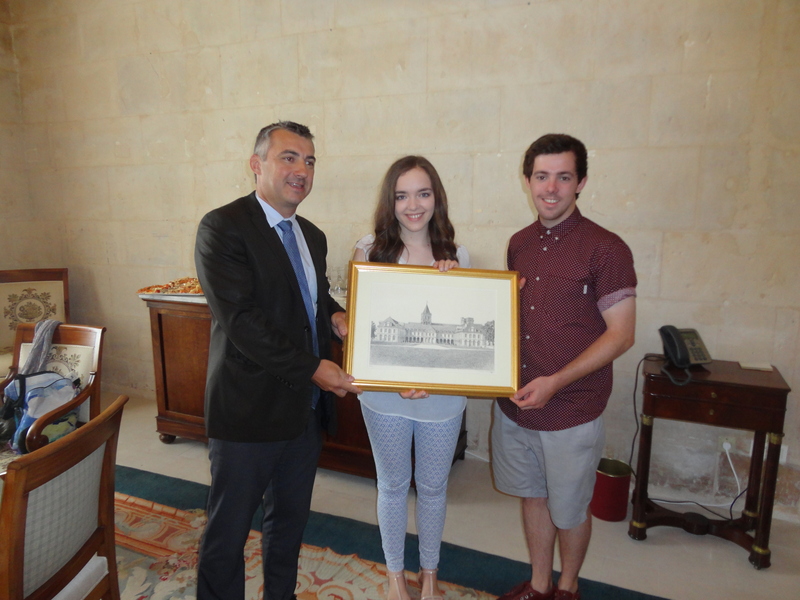 Here the President of the Regional Council gave a short speech of welcome and thanks and he presented Alex and Bethany with a beautiful framed print of the Abbaye aux Dames as a gift from the people of Normandy. 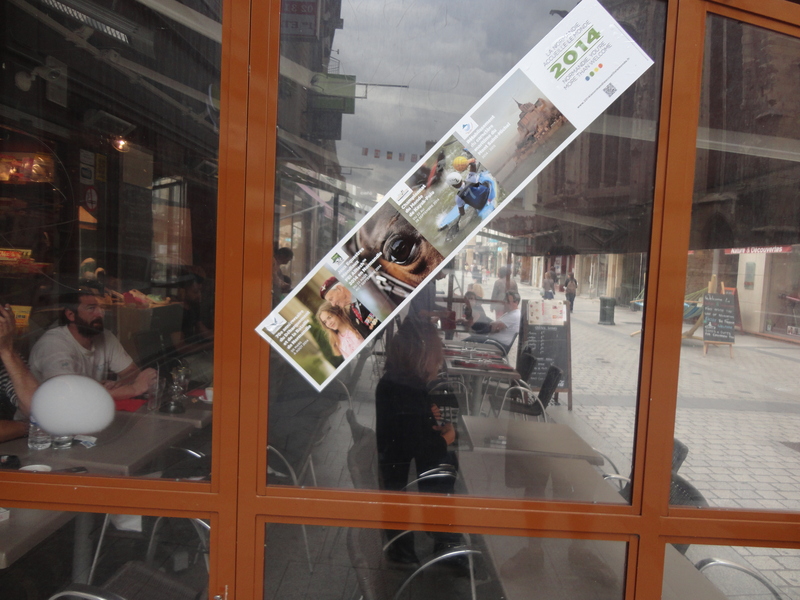 It will grace their new home for many years to come and will be a constant reminder of our visit to see the poster. 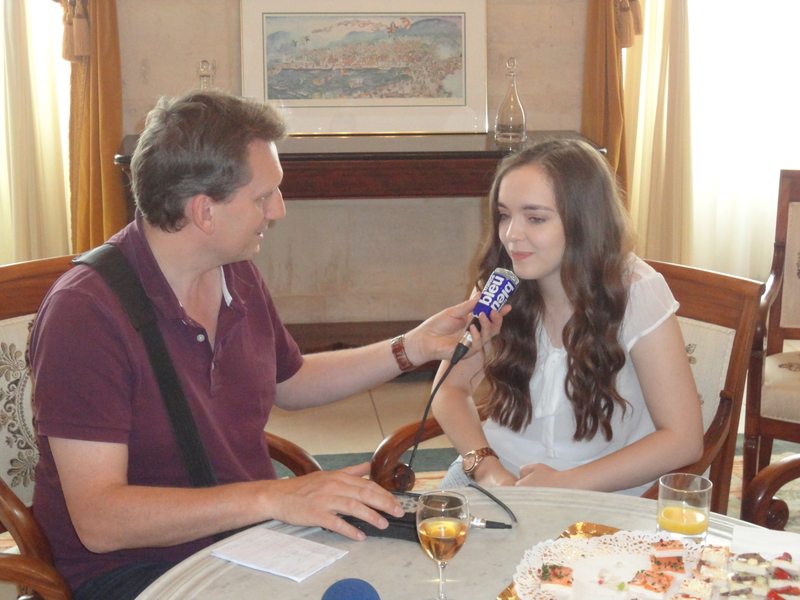 There followed a series of interviews with the press and the local radio station. We interspersed interviews with visits to the food table. 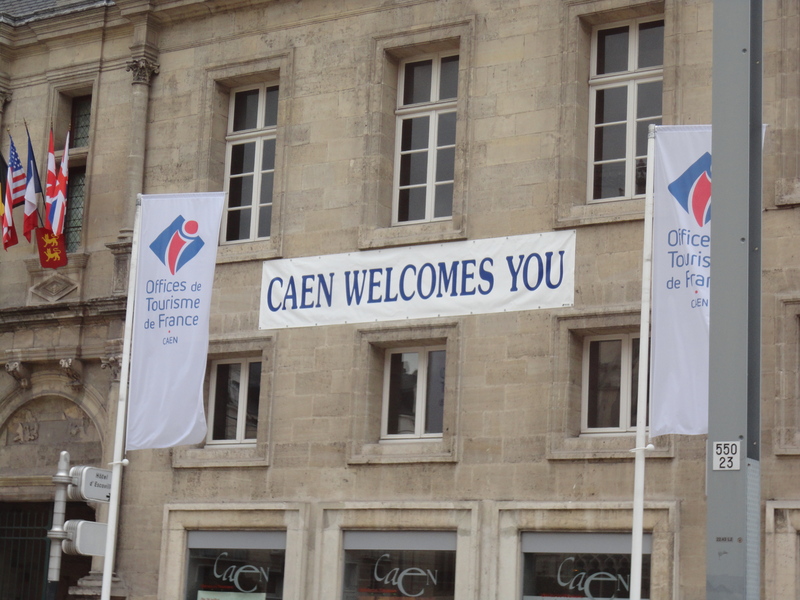 After some time, we said goodbye to Greg and will one day accept his invitation to lunch next time we are in Caen. Greg lives in a little village near Caen, on a farm with his wife and three daughters. That’s an invitation I intend to keep! I was wondering how good his family photographs are!! We then bade farewell to all in the Regional Council and left for lunch at Emmanuelle’s home. 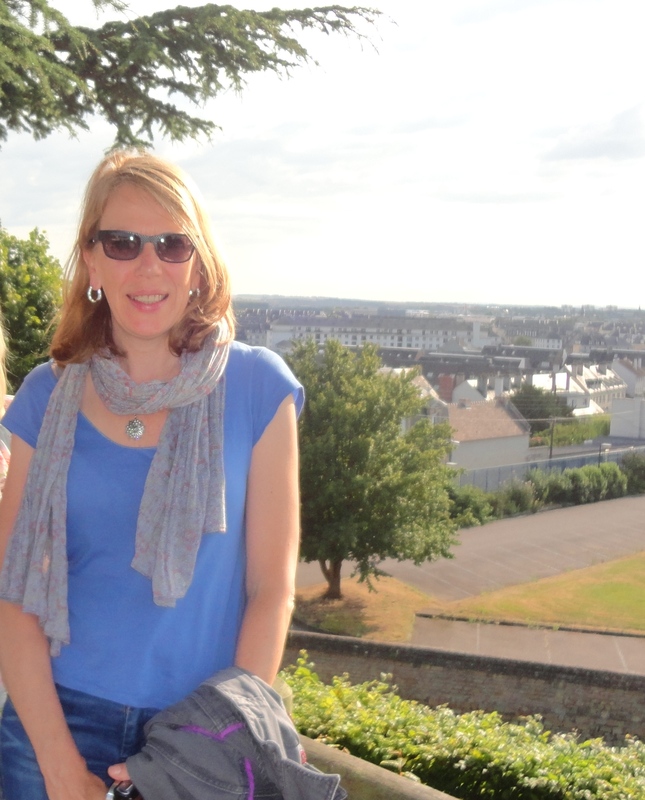 We took a detour into Caen city centre and while the girls did some quick shopping, Alex and enjoyed a cheeky café au lait in a pavement café. We smiled as we sat there, as on every shop around the café there was the poster with my dad and Bethany watching over us. 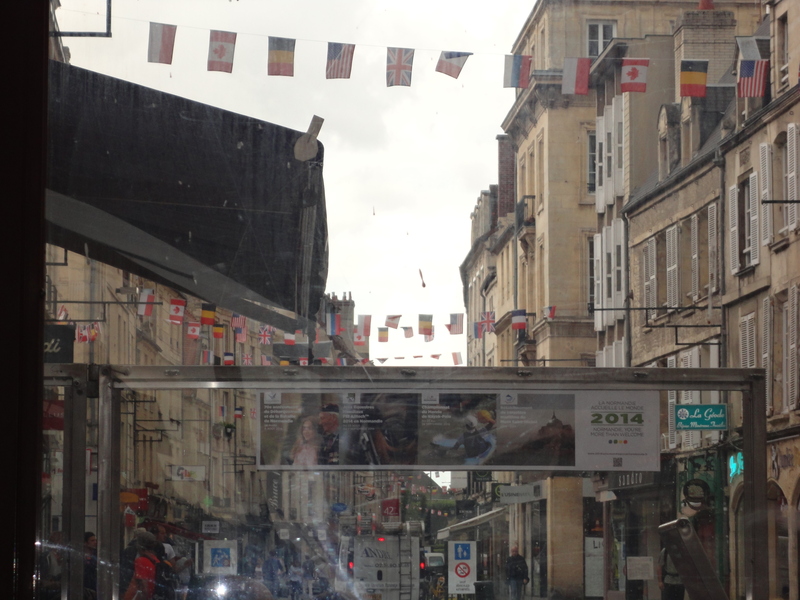 Apparently the image is on all the buses and trams and is seen all over Normandy. There are even several giant copies of the poster on the railway stations and Metro subways in Paris. Lunch, like everything else was delightful and we reluctantly said goodbye to our wonderful, generous host before starting or journey back home. It had been one of the most amazing twenty-four hours of our lives. We are so grateful to all who made it possible, so humbled that this image had been chosen, so thankful that millions of people will have seen my lovely dad and my precious daughter and above else we are touched that the image has become a symbol of peace. My dad’s Christian faith had brought him peace in his life and hopefully his lovely smile and the contentment on the face of his beautiful grand daughter will have brought hope and peace to others. We must never forget the bravery and sacrifice of the veterans and all those who gave so much to give us our freedom. Little did we know when we promised my father that we would return for the 70th anniversary commemorations that his presence would be with us in such a powerful but simple way. Thank you for sharing your experiences. It must have been such a wonderful time for you, the story touches my heart. It took my mind back to our family experience. My father was in the 1914 / 18 war. Apparently last minute count, there was one too many in the battalion to be sent to France and my father was the one who was eliminated. Sadly not one of the battalion returned alive. This humbles me because here I am and have seven grandchildren. Thanks… can you mail me your e.mail address? I would love to talk more! Thank you for sharing your experiences. It must have bee such a wonderful time for you. Your story touches my heart and reminds me of my father’s experience whilst he served in the 1914 / 18 war. 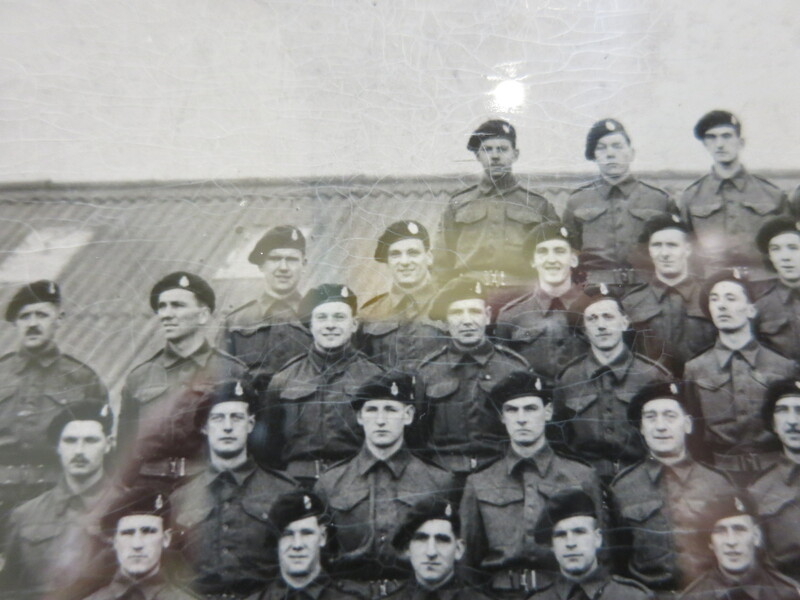 The battalion was ready to be sent to France but it was discovered there was one too many which meant one soldier had to be eliminated and that soldier was my father. Sadly, not one of those soldiers came back alive. This makes me feel so very humble!! My father who was a concert pianist was asked to sing to the boys that night before they went to France. As everybody lay on their beds in the dark as they listened to my father sing to them the songs of that time. Here I am today, though Olga my wife, has been taken to heaven, I have three lovely children and seven lovely grand children. I have so much to thank The Lord. Thankyou for a wonderful account of your travels over the years to commemerate such an important part of our history. Thanks for your lovely comments. Where did Wayne go to school? I too very much enjoyed reading Roger’s account today. What a wonderful experience. I know Dawn that you have had sight of my book about the men of Dinas and Michaelston who gave their lives in the 1WW and invite you to contact me to share experiences.